Whilst Britain’s native squirrel, the red squirrel (Sciurus vulgaris L.), is in serious decline in England and Wales, figures suggest that in regions of SW Scotland numbers are on the increase. Scientists now understand that red squirrels, one of our most iconic woodland animals, can survive happily in both deciduous and conifer habitats, but don’t seem to be able to compete in deciduous woodlands or small and fragmented habitats if there are grey squirrels around (Forest Research; red squirrel). Management of habitat for red squirrels favours large (200-2000 ha) areas of mixed conifer, with native small-seeded trees such as rowan, willow, birch, alder and ash. Whilst red squirrels enjoy hazel nuts and acorns (which are actually a bit indigestible because of their high tannin content), these larger seeds are also enjoyed by their grey cousins, and competition for these food sources often results in the reds losing out. There are now habitat management strategies for woodlands with red squirrel populations. 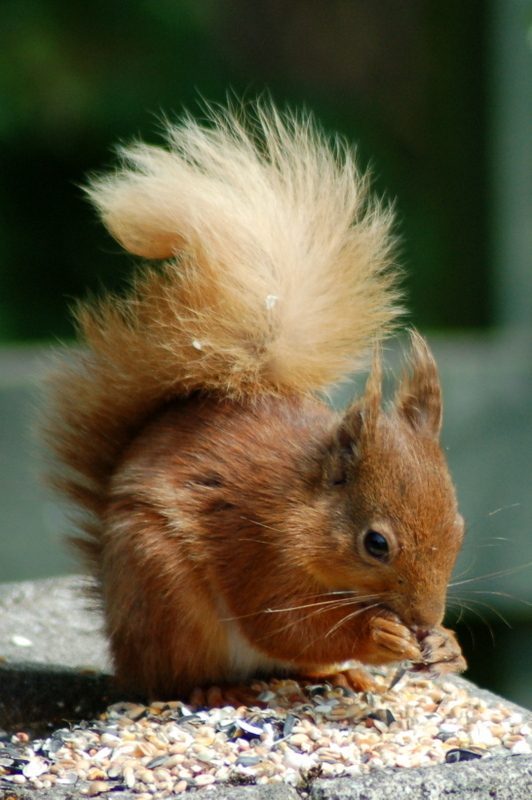 But red squirrels have also been devastated in recent years by Squirrelpox; a deadly virus carried by grey squirrels, which doesn’t affect non-native greys but is fatal to native reds. 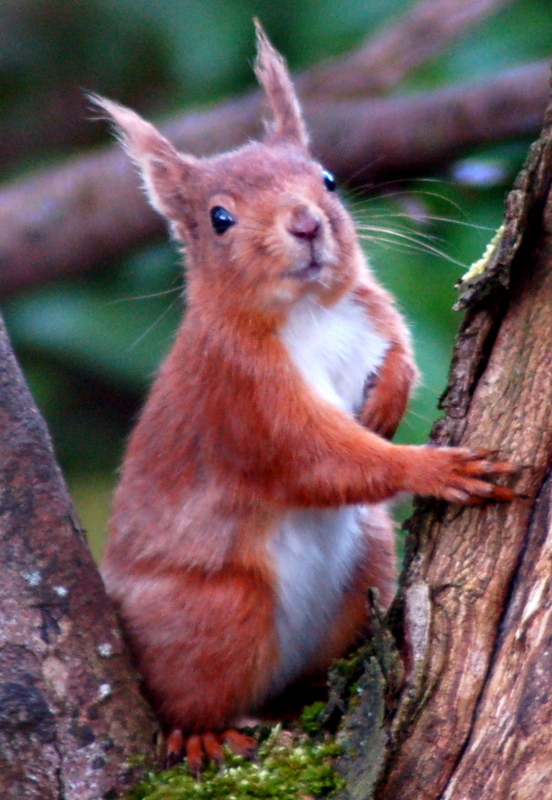 In 2007 the first outbreaks of squirrelpox were found in the Dumfries and Galloway area, thought to have come over the Scottish-English border, and quickly spread throughout the region. The effect was devastating and huge areas, including Wood Elf Towers, lost their regular garden visitors over the next few years. 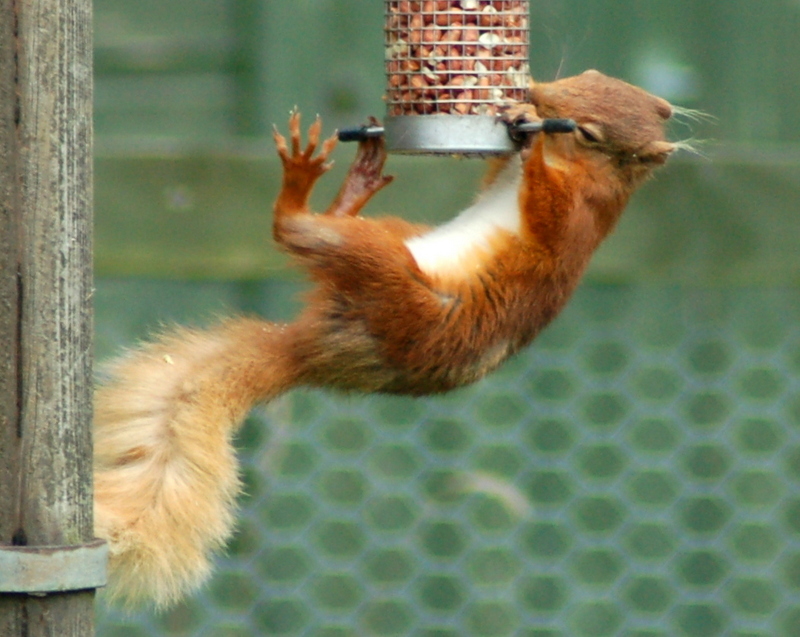 But monitoring disease outbreaks and prompt action has resulted in our local red squirrels making a come back to a bird feeder near you! Our lovely red squirrels- Cyril and Cyrilina (and perhaps some Cyrilettes in the future!) now enjoy a hearty breakfast at the purpose-made squirrel box (fullof sunflower seeds) whilst also snacking at the bird feeders and even the fat balls too – squirrels are nothing if not eclectic in their choice of ‘menu du jour’! Squirrels like peanuts too! Photo Mike Hall.